De’Longhi Australia CEO Paolo Albertoni with New South Wales Premier Barry O’Farrell. De’Longhi Australia has been named the best Large Enterprise for 2013 at the Italian Chamber of Commerce (Sydney) Business Excellence Awards, presented on Wednesday 27 November 2013 at Le Montage in Lilyfield. In addition to supplying the De’Longhi brand of small and large appliances, the company based in Prestons, in western Sydney, also distributes Kenwood and Braun small appliances. 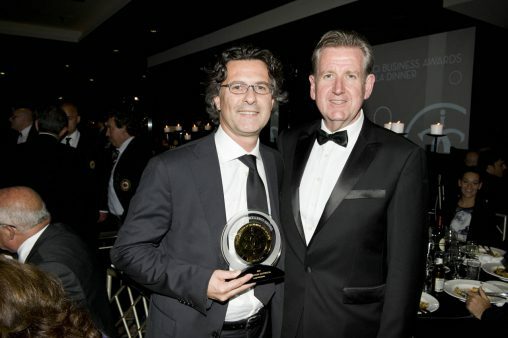 These awards are held annually to recognise Australian businesses that are members of the Italian Chamber of Commerce. There are three awards presented, one each for Large and Small-to-Medium businesses (SME) and a Lifetime Achievement Award. Joining De’Longhi on the winners’ podium were SME winner Fanuli Furniture, a Cremorne retailer of Italian and Australian designer furniture; and Leslie Schirato from Vittoria Coffee, winner for his longstanding contribution to Australian business. Paolo Albertoni, CEO of De’Longhi Australia, said it was wonderful to recognised for representing the great Italian values of family, innovation, entrepreneurship and design. “It is something we should be all very proud of and a great indication of how well we have done and how we are perceived in Australia and, in particular in this case, within the Italian community,” he said. Meanwhile, Fabio Fanuli from Fanuli Furniture said it was a great honour to win the SME award.